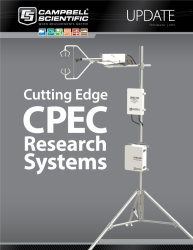 In 2016, Campbell Scientific introduced the CCFC field camera, which captures high-resolution photos and videos using an internal timer, motion detection, or a trigger from a datalogger. This ultra-rugged camera features low power consumption, wide operating temperature range, high-quality 18x optical zoom lens, low-light capabilities, and Wi-Fi compatibility. A complete list of changes is provided at www.campbellsci.com/revisions?dl=379. Campbell Scientific is especially excited about the NDVI capability. This new feature was added at the request of customers interested in crop phenology—the analysis and understanding of crop development. How Is NDVI Data Captured? NDVI uses visible and near-infrared light to show the health of vegetation. Healthy vegetation mostly absorbs visible light and reflects near-infrared light. While, unhealthy or sparse vegetation reflects more visual light and absorbs more infrared light. The following images show both a standard and an NDVI image of the same location. Standard image capture (left) and NDVI capture of healthy and unhealthy vegetation. In the photo on the left it is easy to see lots of green trees but is hard to pick out where unhealthy or dead vegetation is present. The photo on the right shows mostly red indicating healthy vegetation; the sick, dead trees are yellow, which indicates unhealthy vegetation. All NDVI photos have the following bar along the bottom of the image for reference. Colors on the far right (closer to +1.0) are heathier while colors on the left are unhealthy or not vegetation (closer to -1.0). Prior to adding this capability to the CCFC, NDVI images often were obtained by satellites, which are publicly available on the NASA website. However, satellite images are of large land masses, which are often not specific enough for individual applications. The CCFC with the NDVI capability can provide the close up images required by many applications. 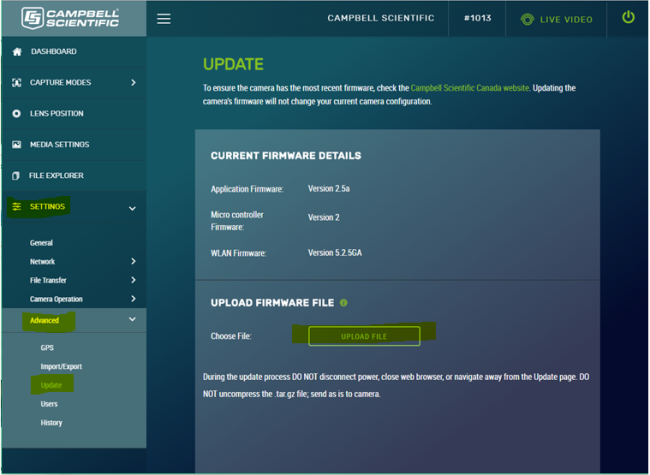 Click campbellsci.com/downloads/ccfc-firmware to download the CCFC Firmware v2.5 update file. Open your CCFC dashboard and navigate to Settings | Advanced | Update. Select Choose File and upload the software file. After updating to version 2.5, navigate to the Media Setting menu. 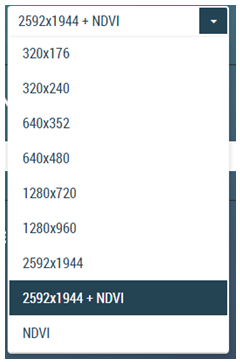 Select either 2592x1944 + NDVI to capture both standard and NDVI images, or NDVI to capture NDVI images only. Campbell Scientific is committed to continually improve our products to better support our customers' needs. The new NDVI capability for the CCFC is an example of this commitment, and allows us to better support vegetation dynamics, biomass production, grazing management, changes in rangeland condition, soil moisture, CO2 flux, or other NDVI applications.